Not to be confused with Carbamazine. Common side effects include nausea and drowsiness. Serious side effects may include skin rashes, decreased bone marrow function, suicidal thoughts, or confusion. It should not be used in those with a history of bone marrow problems. Use during pregnancy may cause harm to the baby; however, stopping the medication in pregnant women with seizures is not recommended. Its use during breastfeeding is not recommended. Care should be taken in those with either kidney or liver problems. Carbamazepine was discovered in 1953 by Swiss chemist Walter Schindler. It was first marketed in 1962. It is available as a generic medication. It is on the World Health Organization's List of Essential Medicines, which lists the most effective and safe medicines needed in a health system. The wholesale cost in the developing world is between 0.01 and US$0.07 per dose as of 2014. In 2016, it was the 197th most prescribed medication in the United States, with more than 2 million prescriptions. Carbamazepine is typically used for the treatment of seizure disorders and neuropathic pain. It is used off-label as a second-line treatment for bipolar disorder and in combination with an antipsychotic in some cases of schizophrenia when treatment with a conventional antipsychotic alone has failed. It is not effective for absence seizures or myoclonic seizures. In the United States, the FDA-approved medical uses are epilepsy (including partial seizures, generalized tonic-clonic seizures and mixed seizures), trigeminal neuralgia, and manic and mixed episodes of bipolar I disorder. The drug is also claimed to be effective for ADHD. As of 2014, a controlled release formulation was available for which there is tentative evidence showing fewer side effects and unclear evidence with regard to whether there is a difference in efficacy. effects on the body's production of red blood cells, white blood cells, and platelets: rarely, there are major effects of aplastic anemia and agranulocytosis reported and more commonly, there are minor changes such as decreased white blood cell or platelet counts, but these do not progress to more serious problems. risks to the fetus in women who are pregnant, specifically congenital malformations like spina bifida, and developmental disorders. Common adverse effects may include drowsiness, dizziness, headaches and migraines, motor coordination impairment, nausea, vomiting, and/or constipation. Alcohol use while taking carbamazepine may lead to enhanced depression of the central nervous system. Less common side effects may include increased risk of seizures in people with mixed seizure disorders, abnormal heart rhythms, blurry or double vision. Also, rare case reports of an auditory side effect have been made, whereby patients perceive sounds about a semitone lower than previously; this unusual side effect is usually not noticed by most people, and disappears after the person stops taking carbamazepine. Carbamazepine has a potential for drug interactions; caution should be used in combining other medicines with it, including other antiepileptics and mood stabilizers. Lower levels of carbamazepine are seen when administrated with phenobarbital, phenytoin, or primidone, which can result in breakthrough seizure activity. Carbamazepine, as a CYP450 inducer, may increase clearance of many drugs, decreasing their concentration in the blood to subtherapeutic levels and reducing their desired effects. Drugs that are more rapidly metabolized with carbamazepine include warfarin, lamotrigine, phenytoin, theophylline, and valproic acid. Drugs that decrease the metabolism of carbamazepine or otherwise increase its levels include erythromycin, cimetidine, propoxyphene, and calcium channel blockers. Carbamazepine also increases the metabolism of the hormones in birth control pills and can reduce their effectiveness, potentially leading to unexpected pregnancies. As a drug that induces cytochrome P450 enzymes, it accelerates elimination of many benzodiazepines and decreases their action. Grapefruit juice raises the bioavailability of carbamazepine by inhibiting CYP3A4 enzymes in the gut wall and in the liver. Carbamazepine increases the processing of methadone resulting in lower blood levels. Serious skin reactions such as Stevens–Johnson syndrome or toxic epidermal necrolysis due to carbamazepine therapy are more common in people with a particular human leukocyte antigen allele, HLA-B*1502. Odds ratios for the development of Stevens-Johnson syndrome or toxic epidermal necrolysis in people who carry the allele can be in the double, triple or even quadruple digits, depending on the population studied. HLA-B*1502 occurs almost exclusively in people with ancestry across broad areas of Asia, but has a very low or absent frequency in European, Japanese, Korean and African populations. However, the HLA-A*31:01 allele has been shown to be a strong predictor of both mild and severe adverse reactions, such as the DRESS syndrome form of severe cutaneous reactions, to carbamazepine among Japanese, Chinese, Korean, and Europeans. Carbamazepine is a sodium channel blocker. It binds preferentially to voltage-gated sodium channels in their inactive conformation, which prevents repetitive and sustained firing of an action potential. Carbamazepine has effects on serotonin systems but the relevance to its antiseizure effects is uncertain. There is evidence that it is a serotonin releasing agent and possibly even a serotonin reuptake inhibitor. Carbamazepine was discovered by chemist Walter Schindler at J.R. Geigy AG (now part of Novartis) in Basel, Switzerland, in 1953. It was first marketed as a drug to treat epilepsy in Switzerland in 1963 under the brand name "Tegretol"; its use for trigeminal neuralgia (formerly known as tic douloureux) was introduced at the same time. It has been used as an anticonvulsant and antiepileptic in the UK since 1965, and has been approved in the US since 1968. 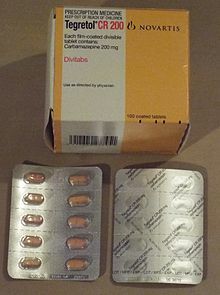 Carbamazepine is available worldwide under many brand names. ^ a b c d e f g h i j k l m n "Carbamazepine". The American Society of Health-System Pharmacists. Archived from the original on 2015-02-27. Retrieved 28 Mar 2015. ^ a b c d e f g h i j k l m n o "Carbamazepine Drug Label". Archived from the original on 2014-12-08. ^ Nolan, SJ; Marson, AG; Weston, J; Tudur Smith, C (28 April 2016). "Phenytoin versus valproate monotherapy for partial onset seizures and generalised onset tonic-clonic seizures: an individual participant data review". The Cochrane Database of Systematic Reviews. 4: CD001769. doi:10.1002/14651858.CD001769.pub3. PMID 27123830. ^ Nevitt, SJ; Marson, AG; Weston, J; Tudur Smith, C (27 February 2017). "Carbamazepine versus phenytoin monotherapy for epilepsy: an individual participant data review". The Cochrane Database of Systematic Reviews. 2: CD001911. doi:10.1002/14651858.CD001911.pub3. PMID 28240353. ^ Smith, Howard S. (2009). Current therapy in pain. Philadelphia: Saunders/Elsevier. p. 460. ISBN 9781416048367. Archived from the original on 2016-03-05. ^ Moshé, Solomon (2009). The treatment of epilepsy (3 ed.). Chichester, UK: Wiley-Blackwell. p. xxix. ISBN 9781444316674. Archived from the original on 2016-03-05. ^ Principles and practice of stereotactic radiosurgery. New York: Springer. 2008. p. 536. ISBN 9780387710709. Archived from the original on 2016-03-05. ^ Ceron-Litvoc D, Soares BG, Geddes J, Litvoc J, de Lima MS (January 2009). "Comparison of carbamazepine and lithium in treatment of bipolar disorder: a systematic review of randomized controlled trials". Hum Psychopharmacol. 24 (1): 19–28. doi:10.1002/hup.990. PMID 19053079. ^ Millichap, J Gordon (1 March 1996). "Carbamazepine: A Therapy for ADHD". Pediatric Neurology Briefs. 10 (3): 20. doi:10.15844/pedneurbriefs-10-3-5. ^ Powell, Graham; Saunders, Matthew; Rigby, Alexandra; Marson, Anthony G. (2016-12-08). "Immediate-release versus controlled-release carbamazepine in the treatment of epilepsy". The Cochrane Database of Systematic Reviews. 12: CD007124. doi:10.1002/14651858.CD007124.pub5. ISSN 1469-493X. PMID 27933615. ^ Gandelman, MS (March 1994). "Review of carbamazepine-induced hyponatremia". Progress in Neuro-psychopharmacology & Biological Psychiatry. 18 (2): 211–33. doi:10.1016/0278-5846(94)90055-8. PMID 8208974. ^ Jentink, J; Dolk, H; Loane, MA; Morris, JK; Wellesley, D; Garne, E; de Jong-van den Berg, L; EUROCAT Antiepileptic Study Working Group (2010-12-02). "Intrauterine exposure to carbamazepine and specific congenital malformations: systematic review and case-control study". BMJ. 341: c6581. doi:10.1136/bmj.c6581. PMC 2996546. PMID 21127116. ^ Lige Liu; Thomas Zheng; Margaret J. Morris; Charlott Wallengren; Alison L. Clarke; Christopher A. Reid; Steven Petrou; Terence J. O'Brien (2006). "The Mechanism of Carbamazepine Aggravation of Absence Seizures". JPET. 319 (2): 790–798. doi:10.1124/jpet.106.104968. PMID 16895979. Archived from the original on 2015-06-25. ^ Tateno A, Sawada K, Takahashi I, Hujiwara Y (Aug 2006). "Carbamazepine-induced transient auditory pitch-perception deficit". Pediatr Neurol. 35 (2): 131–4. doi:10.1016/j.pediatrneurol.2006.01.011. PMID 16876011. ^ Stafstrom CE, Nohria V, Loganbill H, Nahouraii R, Boustany RM, DeLong GR (January 1995). "Erythromycin-induced carbamazepine toxicity: a continuing problem". Arch Pediatr Adolesc Med. 149 (1): 99–101. doi:10.1001/archpedi.1995.02170130101025. PMID 7827672. Archived from the original on 2010-11-18. ^ Moody D (2004). "Drug interactions with benzodiazepines". In Raymon LP, Mozayani A (eds.). Handbook of Drug Interactions: a Clinical and Forensic Guide. Humana. pp. 3–88. ISBN 978-1-58829-211-7. ^ Gonzalez, Frank J.; Robert H. Tukey (2006). "Drug Metabolism". In Laurence Brunton; John Lazo; Keith Parker (eds.). Goodman & Gilman's The Pharmacological Basis of Therapeutics (11th ed.). New York: McGraw-Hill. p. 79. ISBN 978-0-07-142280-2. ^ Schlatter, J; Madras, JL; Saulnier, JL; Poujade, F (4 September 1999). "Interactions médicamenteuses avec la méthadone" [Drug interactions with methadone]. Presse Médicale (in French). 28 (25): 1381–4. PMID 10506872. ^ Kaniwa, N; Saito, Y (June 2013). "Pharmacogenomics of severe cutaneous adverse reactions and drug-induced liver injury". Journal of Human Genetics. 58 (6): 317–26. doi:10.1038/jhg.2013.37. PMID 23635947. ^ a b Amstutz, U; Shear, NH; Rieder, MJ; Hwang, S; Fung, V; Nakamura, H; Connolly, MB; Ito, S; Carleton, BC; CPNDS clinical recommendation, group (April 2014). "Recommendations for HLA-B*15:02 and HLA-A*31:01 genetic testing to reduce the risk of carbamazepine-induced hypersensitivity reactions". Epilepsia. 55 (4): 496–506. doi:10.1111/epi.12564. PMID 24597466. ^ Leckband, SG; Kelsoe, JR; Dunnenberger, HM; George AL, Jr; Tran, E; Berger, R; Müller, DJ; Whirl-Carrillo, M; Caudle, KE; Pirmohamed, M; Clinical Pharmacogenetics Implementation, Consortium (September 2013). "Clinical Pharmacogenetics Implementation Consortium guidelines for HLA-B genotype and carbamazepine dosing". Clinical Pharmacology and Therapeutics. 94 (3): 324–8. doi:10.1038/clpt.2013.103. PMC 3748365. PMID 23695185. ^ Garon SL, Pavlos RK, White KD, Brown NJ, Stone CA, Phillips EJ (2017). "Pharmacogenomics of off-target adverse drug reactions". British Journal of Clinical Pharmacology. 83 (9): 1896–1911. doi:10.1111/bcp.13294. PMC 5555876. PMID 28345177. ^ Rogawski MA, Löscher W, Rho JM (2016). "Mechanisms of Action of Antiseizure Drugs and the Ketogenic Diet". Cold Spring Harb Perspect Med. 6 (5): a022780. doi:10.1101/cshperspect.a022780. PMC 4852797. PMID 26801895. ^ Dailey, JW; Reith, ME; Steidley, KR; Milbrandt, JC; Jobe, PC (1998). "Carbamazepine-induced release of serotonin from rat hippocampus in vitro". Epilepsia. 39 (10): 1054–63. doi:10.1111/j.1528-1157.1998.tb01290.x. PMID 9776325. ^ Dailey, JW; Reith, ME; Yan, QS; Li, MY; Jobe, PC (11 June 1997). "Carbamazepine increases extracellular serotonin concentration: lack of antagonism by tetrodotoxin or zero Ca2+". European Journal of Pharmacology. 328 (2–3): 153–62. doi:10.1016/s0014-2999(97)83041-5. PMID 9218697. ^ Kawata, Yuko; Okada, Motohiro; Murakami, Takuya; Kamata, Akihisa; Zhu, Gang; Kaneko, Sunao (2001). "Pharmacological discrimination between effects of carbamazepine on hippocampal basal evoked serotonin release". British Journal of Pharmacology. 133 (4): 557–567. doi:10.1038/sj.bjp.0704104. PMC 1572811. PMID 11399673. ^ Schindler W, Häfliger F (1954). "Über Derivate des Iminodibenzyls". Helvetica Chimica Acta. 37 (2): 472–83. doi:10.1002/hlca.19540370211. ^ a b Prosser, R.S. ; Sibley, P.K. (February 2015). "Human health risk assessment of pharmaceuticals and personal care products in plant tissue due to biosolids and manure amendments, and wastewater irrigation". Environment International. 75: 223–233. doi:10.1016/j.envint.2014.11.020. ISSN 0160-4120. PMID 25486094.